#1 San Francisco Summer Tech Camp and STEM Camp! Award-Winning Summer Camps. #1 In STEM. We Are Creating A Tech Revolution. 40+ Cutting-Edge Majors and Minors. Excellent Curricula. Talented Instructors. Dynamic Programming. Top-Notch Locations. A Super Fun Experience. Building Confidence. Developing Life Skills. Empowering The Next Generation in Tech. Camp Tech Revolution Is The Ultimate Tech Camp Experience. Campers learn from passionate and talented instructors, and specialize in 1 Major and 1 Minor each week, which greatly helps to improve skills, pursue a passion, and meet friends with similar interests! We Are Redefining Summer Tech Camps. At Camp Tech Revolution, our campers have the chance to work with some of the most cutting-edge topics in technology today. Campers attend one camp each week, and select 1 Major & 1 Minor for the entire week, allowing for opportunity to focus and improve in certain subject matter, but also allow for a variation of topics throughout the week. Our 9am to 5pm schedule allows campers to fully immerse themselves in the subject matter at camp, improve skill sets, and create awesome projects, all while learning from talented instructors (we hire less than 8% of applicants). We offer a 1:5 to 1:10 staff to camper ratio or better at camp! We also allow for plenty of socialization and outdoor time during snack and recess with daily sports options during these break periods, which helps to create a holistic approach of tech learning and physical exercise at Camp Tech Revolution. A Great Investment In Your Child. Combining lots of education and fun, an investment in this amazing camp experience is an investment in YOUR child. And yes… campers can attend the same Majors/Minors for multiple weeks… as they move up in our curriculum, or select different Majors and Minors each week to broaden their scope of learning. We provide lots of great course options each week, allowing YOU to create an optimal schedule for your child! If you would like our assistance in planning, we are always happy to help! Just call our tech camp specialists at 888.854.CAMP, send us an email, or chat with us on our website. We Create Innovators. We Empower Game Changers. Our Campers Are Changing The World. Through hands-on, project based learning, and expertly developed and proprietary curricula, our campers have a chance to learn the latest in technology, and discover how they can use these skills to take their creativity to new heights, and turn ideas into reality. Our San Francisco campers can learn how to Build Websites, Engineer Robots, Improve Skills in Fortnite, Overwatch or League of Legends, Interact with Artificial Intelligence, Design Cool Graphics, Improve Esports Skills and Learn Safe Practices For Gaming, Design for Virtual Reality, Encrypt/Decrypt Using Ciphers, Build Computers, Write Code in Java and Python, Become YouTube Casters, Produce Film and TV, Design Arcade Games, Develop Apps, and so much more! #1 Tech Camp! At Camp Tech Revolution, camp is filled with experiential, hands-on learning, collaboration, excitement, and cutting-edge majors and minors. Curricula is designed for beginner, intermediate, and advanced campers in all age groups, and campers can progress each week. With a staff to camper ratio of 1:8 or better, Camp Tech Revolution is the premier San Francisco-area tech camp experience for campers ages 7 to 14. Are you a tech enthusiast? If so, check out Camp Tech Revolution… you belong here! We’ve Got You Covered. Camp is in session from June 17th to August 2nd, 2019 (Monday through Friday). Regular camp hours from 9am to 5pm with an early arrival option at 8am and an extended day option until 6pm, catered lunch program, sports at recess, camp cheers, red carpet events on Fridays, and lots of learning and fun all week. Free Early Arrival and Extended Day for campers enrolled in 4+ weeks. See below for details! The weekly camp tuition is for regular camp hours: Monday to Friday, 9am to 5pm. Early Arrival: 8am to 9am ($10/day). Extended Day: 5pm to 6pm ($10/day). Lunch Option: ($49/week). Camp is not in session on July 4th. Change The Future. Learn These In-Demand Skills This Summer. Welcome to the exciting world of 3D Printing! You can change the world with 3D Printing technology and get YOUR start at Tech Revolution! In this major, you will use cutting-edge 3D printers to create model prototypes that can change society, with a focus on impact and scalability. With this in mind, we ask campers to design several main projects such as a unique key card, a model spacecraft for NASA, or a new animal or dragon for Minecraft™. 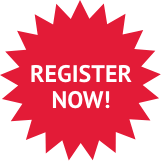 View Course Page Register Now! Build Skills. Learn Strategy. Compete. Game On. Do you know the difference between a Base 4-3 and a Tampa-2 defense? Can you perfectly time your shots in FIFA to get extra power and accuracy? It’s time for boot camp! In this major you can improve your skills, learn strategy, and play tournaments all while having a blast in a dynamic and social environment. At Camp you’ll work on 5 major areas: 1. Safe practices (stretches, exercises, mental breaks); 2. Improving skills and knowledge; 3. Practice gameplay; 4. Drafting, coaching, and designing plays; and 5. End of Week Tournaments. This is your chance to create your own clothing brand and produce a custom pair of Converse Sneakers and customized T-Shirts. Build the technical skills needed to create designs that communicate messages and leave lasting visual impressions. Learn about typography, use pure design elements like colors, shapes, and images, and create clean and effective products. Create a logo and designs that can be placed on hats, t-shirts, hoodies, socks and more. On Friday, showcase your portfolio to the camp! Get a Head Start in the World of Coding. Welcome to the amazing world of programming with Scratch, where campers gain great experience with computer science! Campers use Scratch, a program created by the MIT Media Lab, to code, create, and share projects. Scratch uses a programming language that is in easy to understand English and created for its own platform. By moving and combining blocks of code, campers develop their own programs to create super cool animation projects. Do you want to be a YouTube® caster, have your own Minecraft™ YouTube® Channel, and vlog like a pro?! If so, this major will help you take your skills to the next level! Learn many aspects of the digital movie production industry: ideating and creating content, researching, scripting, filming, screen captures, using special effects, promoting your channel, gaining likes and shares, and lots more. Gain experience with OBS Studio software – we’ll even provide you with a headset for your show! Some project ideas include Let’s Plays, Walkthroughs, Mod Reviews, PvP tips, and How To’s. It’s time to take your Roblox Skills National! Campers compete in exciting events like Ninja Obstacle Course, Epic Survival, Battle Blox, and Freeze Tag. Campers work together throughout the week to compete against other Lavner Camps National Roblox Tournament Week teams across the country at over 20 locations throughout the United States! Campers learn teamwork, cooperation, and the importance of sharing and implementing ideas, as they compete in events. All competitions will be held on our own private VIP servers. Set the stage for a challenging quest, a fast paced adventure, a legendary tale, and more when creating your own 3D world using Minecraft™! Campers team up to customize their own Adventure Maps and shape their own gameplay experience. Campers strategically tailor unique biomes that provide players with challenges and rewards, utilize Redstone to create secret tunnels, traps, and security features, build safe havens with resources that help players move successfully throughout the game, and learn how to install mods that allow campers to create distinct qualities within their Minecraft™ game. Competitions take place throughout the camp week, and a major Friday Tournament takes place each week! Did you know that sites like YouTube®, Instagram™, and Dropbox™ are coded in Python™? In this major, campers learn how to program in Python™ and create awesome projects. During the week, campers create at least one smaller project like a Coin Flipping Simulator, a Magic 8 Ball, an Automatic Sentence Generator, a Weather Predictor App, or a Code Breaking Wizard, and one large project like a text based Escape Game, RPG Game or Adventure Game! 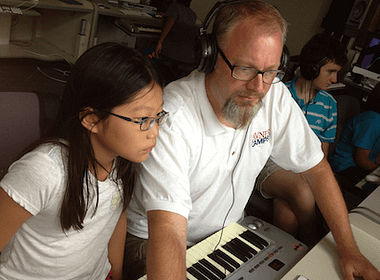 Campers also learn how to program graphics and may learn about computer programs that use Artificial Intelligence! Campers learn how to think like professional programmers while improving their logical thinking skills along the way. 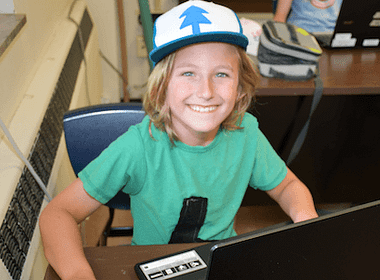 Campers learn programming logic and design skills, and create a variety of different games – Brick Breaker, Space Invaders, Platform Adventure Games (Space Adventures, Jungle Escapes, Race Cars, Snowboarding Sports, Laser Domes) and more! For beginner, intermediate, and advanced campers. With over 70 million users worldwide, Roblox is one of the fastest growing trends in Digital Game Design and Game Play. Learn how to develop your own game using Roblox Studios! Add awesome features such as scoreboards, time clocks, traps, pick up items, or customized terrain. With so many options to add, campers will create a game that is unique, fast paced and fun! Throughout the week, campers also engage in awesome multiplayer competitions using our own, private VIP servers! Use artificial intelligence to carry out a series of fun space missions! Artificial intelligence is an exciting new forefront of technology that is changing the way we live. At camp, we use space missions to explore AI topics while getting engaging and fun hands on experience with artificially intelligent robots, programs, and code! Campers interact with and learn about artificially intelligent programs, meet artificially intelligent robots CHiP® and COZMO™, experiment with easy to understand Scratch AI programs to gain an understanding of how AI is written, and program their own virtual battle bot with Java™! No programming experience required! Robotics offers a great mix of experiential, hands-on learning through building, coding, participating in challenges, and more! Utilizing the latest LEGO® MINDSTORMS® technology, campers configure, program, and control their very own robots. The EV3® platform allows for hundreds of designs while our instructors provide limitless learning. Campers put their technical and creative skills to use by not only building and programming their own robots, but also competing in challenges and our ROBOWARS tournament! Open to beginner, intermediate, and advanced robotics campers. Using K’NEX® roller coaster kits, Roblox, and Minecraft™, build incredible, model-sized roller coasters and digitally design roller coaster simulations on PCs. In addition to improving skills in design, building, and creativity, campers also learn about gravity, mass, inertia, velocity, centripetal acceleration, speed, kinetic and potential energy, compressed air systems, and much more! Learn In-Demand Web Design Skills. Create YOUR Very Own Website! Learn skills in web design and HTML coding to build the website of your dreams…First, create a concept for your website Then, select a template, customize it, and add text. Next, learn HTML code and use it to build your site. There’s more…learn how to use plugins to add bells and whistles to your site. At the end of camp, participate in a website showcase where other campers and staff can beta test the offline versions and enjoy your website! In the YouTube® Video Production Major, campers will master the exciting process of creating a successful vlog! Campers will identify an audience, create a brand, brainstorm a creative format, produce and edit engaging content, and tailor a video for YouTube®. Valuable skills like optimizing SEO, managing online reviews, and embedding vlogs into websites and social platforms are also covered in this exciting program! Utilizing the hands-on format of this course, campers will create everything they need to launch their own YouTube® channel. Sample topics include Minecraft™ Tutorials, Video Game Walkthroughs, Technology Unboxing, Product Reviews, How-To Videos, and so much more! Thwart the Next Big Cyber Attack. Campers learn how to keep information and websites secure. Learn about encryption and decryption and program your own cipher in Scratch! Find out what makes passwords, websites, and networks safe. At the end of the week take home your own cipher program so you can send and receive secret messages to and from your family and friends! Make Your Own Digital Tracks. Learn and develop the skills to create incredible music. Work with hundreds of musical options in an innovative experience where you can drop tracks like a pro. Create, mix, and produce songs in a variety of genres. Studio jam sessions take place during the week, and campers drop their final tracks on Friday at our Music R3volution Showcase! Do you know the difference between a Base 4-3 and a Tampa-2 defense? Can you perfectly time your shots in FIFA to get extra power and accuracy? It’s time for boot camp! In this minor you can improve your skills, learn strategy, and play tournaments all while having a blast in a dynamic and social environment. At Camp you’ll work on 5 major areas: 1. Safe practices (stretches, exercises, mental breaks); 2. Improving skills and knowledge; 3. Practice gameplay; 4. Drafting, coaching, and designing plays; and 5. End of Week Tournaments. This is your chance to create your own clothing brand and produce two customized T-Shirts. Build the technical skills needed to create designs that communicate messages and leave lasting visual impressions. Learn about typography, use pure design elements like colors, shapes, and images, and create clean and effective products. Create a logo and designs that can be placed on hats, t-shirts, hoodies, socks and more. On Friday, showcase your portfolio to the camp! Green living is a lifestyle that tries to conserve and preserve the Earth’s natural resources, habitats, and biodiversity. How can we use technology to enhance green living and improve our environment here on Earth? What technologies can we use or invent to reduce our footprint? These are all topics that you will explore in this minor. In addition, produce and film a PSA (Public Service Announcement) focusing on a technological invention that you want to create to improve green living on Earth! Using Scratch, campers script a short animated film, design characters and backgrounds, and learn coding to bring it all together. Campers complete one animated film and a Film Screening Event will take place on Friday. Campers also leave with their projects at the end of the week! Action-Packed Drills, Games & Competitions. Play a variety of sports, have fun, and get in some good exercise! Although campers get outdoor time during recess each day, this is a way to add to the fun! Play and get instruction in sports such as Soccer, Basketball, Spikeball, Frisbee Golf, Capture the Flag, Badminton, Croquet, Wiffle Ball, and Run the Bases! When creating an RPG game, campers customize a detailed landscape, creating an awesome backdrop for adventure and exploration with impressive graphics. You can also create characters like heroes, neutral civilians, and enemies, as well as items for survival and trade, elements of magic, random environmental events, a fantastic storyline, and do all this while learning programming logic along the way! Are you ready for your next mission? This high energy course teaches campers about the history of international spies, their tactics, and how modern-day technology has transformed the industry. Campers learn spy tactics and work with spy technology using drones/drone simulators, spy bots, Surveillance and traps in Minecraft™ using Redstone, Encryption/Decryption with Ciphers via Python™ or Scratch, and Morse Code. Welcome to the exciting world of 3D Printing! Campers use cutting-edge 3D printers to create model prototypes that can change society, with a focus on impact and scalability. With this in mind, we ask campers to design several main projects such as a unique key card, a model spacecraft for NASA, or new animal or dragon for Minecraft™. Create the Next Pokemon GO. This major is only open to campers who are new to Augmented Reality Camp. If you completed our Augmented Reality Major last summer, we encourage you to register for our Virtual Reality Major. Sites like YouTube®, Instagram™, and Dropbox™ are coded in Python™… Now is YOUR chance to learn how to code in Python™ with a focus on cool apps and projects! During the week, you will code at least one smaller project like a Fortune Telling Genie, Gaming Tips Provider, Virtual Calendar, Baby Namer, Spy Decoder, Mini Calculator, or a Homework Helper, and one larger project like a text based Choose Your Own Adventure Game with graphical features! C++ is used everywhere from video game engines and video editing software to operating systems and office applications. Google, Facebook, Youtube®, and Amazon all make use of C++ in their back-end systems. In addition to learning general programming concepts, you’ll also learn about memory management using pointers; compilers, linkers, and loaders; platform specific compiling; size of data types; and much more! Campers learn about the logic, planning, and calculations that go into building Java™ programs. By the end of the week, have an understanding of the Java™ language and a better grasp of computer languages as a whole. Main Camp Projects may include a tower defense, a tic-tac-toe game, a quiz game, superpong, a platformer game, a calculator, or a graphical choose your own adventure game. Mini projects may include a coin flipping simulator, a magic 8 ball, automatic sentence generator, a silly name generator, a Pig Latin translator, and a pig dice game. Learn valuable skills in Java™ and maybe parlay it into an awesome job as a computer programmer, game developer, or engineer! Take your Minecraft™ Skills to the MAX. Take your Minecraft™ Skills to the MAX by learning how to code mods using Java™ and create a Minecraft™ Engine using 3D Graphics Programming. Learn how to create a 3D environment, control player movement and vision, and place blocks with customizable textures around your world. With this coding project, you will learn how to create the same type of Engine that powers Minecraft™! Additionally, and throughout the week, test your survival skills where you are tasked with the mission to build a sustainable community on a deserted island – difficult terrain and conditions, advanced Redstone needed, and collaborate with teammates to succeed in game play! Tournament events take place every Friday. This major is for intermediate and advanced minecrafters! Excel in one of the Most Popular Esports Games in the World. Fortnite has taken the world by storm and it’s more than just a fun game. If you want to improve your skills, learn how it was created, and have endless fun with other kids your age who love the game as much as you do, then this is the place to be! Our Fortnite camp has 5 major components: Safe Practices: Sensitivity Training and Schedule Optimization, Level Design with Unreal Engine, Improving Skills and Strategy, Creative Mode, and of course…Action-packed gameplay and competitions! Become a Champion in the Multiplayer Online Arena. With millions of players every day, complex strategy, and exciting gameplay, League of Legends remains one of the most popular and competitive video games today. At our Esports Academy, learn how to play better, smarter, and collaboratively all while having a blast in a dynamic and social environment! Our League of Legends Camp has 4 major components: Safe Practices – Sensitivity Training and Schedule Optimization, Improving Skills and Knowledge, Strategy and Analysis, and of course…Action-packed gameplay and competitions! Create at least two games using the uber-powerful GameMaker™ Platform! GameMaker™ Studio software caters to everyone from entry-level novices to game development professionals. You will incorporate professional looking graphics and learn how to write code to power your game. Some games may include Veggie Chops, Dash Games, Off Road Trucking, Fantasy Adventures, Spaces Battles… or your own game! This major gives campers the opportunity to learn and develop Minecraft™ skills for event and tournament play, with tournaments taking place each day. Each morning, campers practice skill development, followed by tournaments and events. Events include Building Competitions (create detailed structures, utilize redstone), Arena Competitions (PVP (player vs. player) and TVT (team vs. team) – conquer the arena), Mini-Games (parkour, spleef, capture the flag and more…), and Survival Challenges (survive, gather resources, build a colony)! On Monday through Wednesday, local tournaments are held within camp, and National tournaments take place on Thursday and Friday. Campers compete in exciting events like: Ninja Obstacle Course, Epic Survival, Battle Blox, Freeze Tag. Campers work together throughout the week to compete against other Lavner Camps National Roblox Tournament Week teams across the country at over 20 locations throughout the United States! Campers learn teamwork, cooperation, and the importance of sharing and implementing ideas, as they compete in events. All competitions will be held on our own private VIP servers. Campers use space missions to explore AI topics while getting engaging and fun hands on experience with artificially intelligent robots, programs, and code! Campers interact with and learn about artificially intelligent programs, meet artificially intelligent robots CHiP® and COZMO™, experiment with easy to understand Scratch AI programs to gain an understanding of how AI is written, and program their own virtual battle bot with Java™! No programming experience required. VEX® IQ allows campers to build more complex robots with more motors (12 ports! ), advanced gears and pulley systems, better sensors, and enhanced controllability. These robots also make use of both a vertical programming language similar to Scratch, and RobotC, the standard for educational robotics and competitions. Some important concepts learned through hands-on experience are force and motion, design and problem solving, mechanical advantage, gear ratios, circumference and arcs, pulley systems, and teamwork. Campers are divided into teams to complete assigned challenges, and compete in a camp-held Robotics Tournament at the end of each week! This major focuses on developing VR Games meant for use on VR headsets and VR Cardboard/Phone. Use Unity to create a cinematically beautiful game focusing on one of the following genres of your choice: (1) A Flying Game – Fly through space around aliens and asteroids to get to the next planet, (2) A Maze Game – an incredible top-down-view game that uses a combination of head tracking and button input to guide your hero to safety, without being destroyed by the obstacles and bosses it may face, or (3) A 360 Arena Game – Create an arena full of challenges and events that test your speed, skill, and hand-eye coordination! Learn many features in Unity that make VR Game creation complex, challenging, and fun. Also, examine through hands-on practice how VR can change the world, and how you can contribute to the advancement of VR use and enjoyment! Do you want to be a YouTube® caster, have your own Minecraft™ YouTube® Channel, and vlog like a pro?! Learn many aspects of the digital movie production industry: ideating and creating content, researching, scripting, filming, screen captures, using special effects, promoting your channel, gaining likes and shares, and lots more! Gain experience with OBS Studio software – we’ll even provide you with a headset for your show! When creating an RPG game, you will customize a detailed landscape, creating an awesome backdrop for adventure and exploration with impressive graphics. You can also create characters like heroes, neutral civilians, and enemies, as well as items for survival and trade, elements of magic, random environmental events, a fantastic storyline, and do all this while learning programming logic along the way! Which player should be drafted in the first round? How much does home-field advantage really matter? Is it worth going for a touchdown on fourth and goal? Why are so many teams increasing the number of 3 pointers they attempt in a game? Learn how to answer these kinds of questions and more. In addition, use the power of computer programming to code a Java™ program that assigns a Player Efficiency Rating (PER) using a model that you create yourself. Along with learning how to analyze stats and make theories and assertions, campers will participate in an All-Camp Fantasy Baseball League and put their skills to work! This action-packed minor teaches the history of international spies, their tactics, and how modern-day technology has transformed the industry. Learn spy tactics and work with spy technology using drones and flight simulators, spy bots, Surveillance and Redstone traps in Minecraft™, Encryption/Decryption with Ciphers via Python™, and Morse Code. On Friday, campers engage in Spy Competitions! Learn about some of the most exciting tech stocks on the market like Snapchat, Facebook, Google, Apple, Twitter, and more. Campers learn how to analyze a company’s financials, study historical performance, and calculate P/E ratios, earnings per share, dividends, and valuations. Campers also receive $1,000,000 of “play money” on Monday for stock purchases throughout the week at our “R3VOLUTION Exchange,” with the goal of selling for a profit on Friday! Campers will master the exciting process of creating a successful vlog! Campers will identify an audience, create a brand, brainstorm a creative format, produce engaging content, and tailor a video for YouTube®. Utilizing the hands-on format of this course, campers will create everything they need to launch their own YouTube® channel. Sample topics include Minecraft™ Tutorials, Video Game Walkthroughs, Technology Unboxing, Product Reviews, How-To Videos, and so much more! At Camp Tech Revolution, we help campers build their self-confidence. Whether it’s coding an app or building a robot, campers have the opportunity to substantially improve their self-confidence by completing projects of their own! With over 40 different course offerings, we have something for everyone! Whether a camper wants to become a game designer, computer programmer, or esports champion, our expert instructors and unbeatable curricula let campers grow in fields they are passionate about. Learn through doing. Our unique curricula and hands-on teaching methods give campers the opportunity to learn through doing. The camps are designed by industry experts in education and our campers improve their skills, learn a lot, and have fun! Family-Owned Organization and Founder Led. 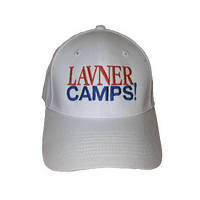 Lavner Camps, a family-owned camp organization, cares deeply about providing a top-notch camp experience for its campers and camp families. Your success is our success. Camp Tech Revolution campers have access to our cutting-edge curricula, all developed by our in-house experts. 1 Major & 1 Minor Each Week. Campers participate in one major and one minor each week, providing them with the opportunity to experience two course in depth each week. 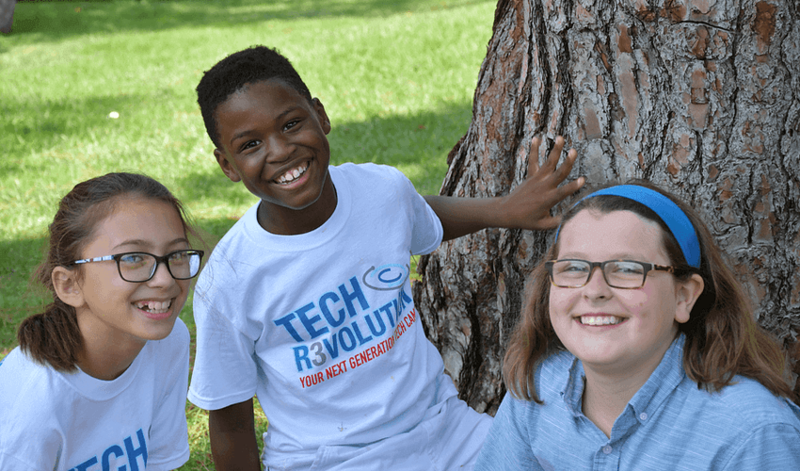 Tech Revolution Campers attend camp at premier private school and university locations. Camp Tech Revolution provides the equipment needed to ensure an excellent learning environment where campers have the tools for success. 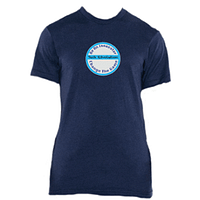 A Camp Tech Revolution Certificate of Excellence, Official T-shirt, and more! 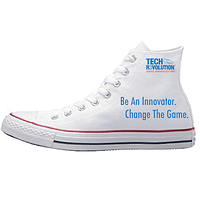 Each camper leaves with a Tech Revolution Certificate of Excellence and and an Official Tech Revolution T-Shirt. Most campers also take home a final project (like a 3D-printed masterpiece or a new app). Campers also leave with incredible memories, new friends, and vastly improved skills! There are many more great things that happen at camp. Join us at Camp Tech Revolution for an awesome experience this summer and to find out more! 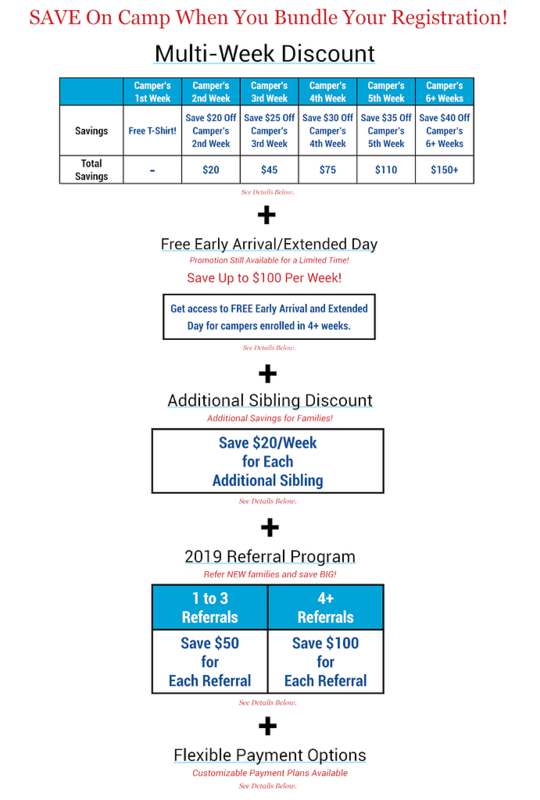 We offer early arrival (8am to 9am) and extended day (5pm to 6pm) for families who need extra coverage or for campers who want to get even more of the Tech Revolution experience. If a camper registers for 4+ weeks of camp, early arrival and extended day is free. We offer a catered lunch program for those who do not wish to pack lunch from home. 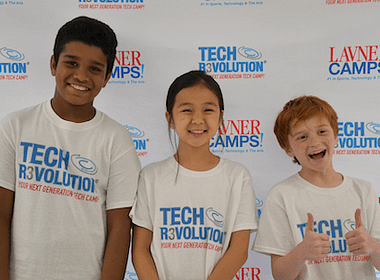 Why is Camp Tech Revolution #1 in Technology & STEM Camps? We have a constant and relentless commitment to providing the best technology courses possible, coupled with personalized attention and an emphasis on safety and fun. Our in-house experts, who hold degrees from The Wharton School, Penn Engineering, Columbia University, Cornell University, Harvard University Graduate School of Education and more, work year-round to develop top-notch curricula for our campers. These curricula, in conjunction with talented and passionate camp instructors, prestigious camp locations, and over 40 unique majors and minors, have allowed us to remain the global leader in technology camps. The American Camp Association has hundreds of guidelines for accreditation covering health, wellness, operation, safety, and more, which are strictly enforced through regular site visits. 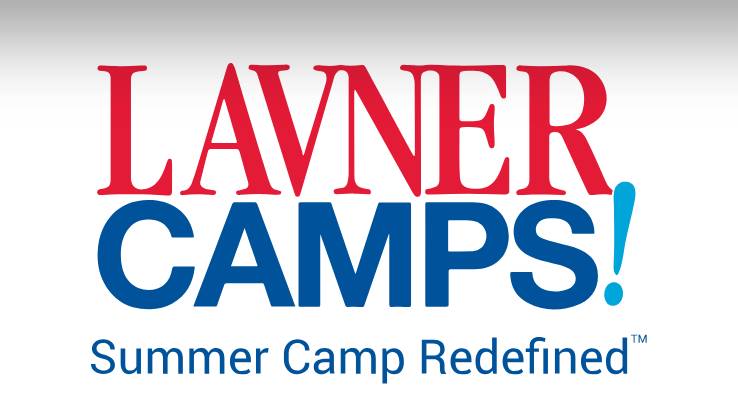 Lavner Camps is accredited by the American Camp Association in PA and NJ and carry similar standards to other states. We invest in ACA accreditation because our camp families deserve the best!